After five tropical storms to start the 2006 hurricane season Ernesto became the first hurricane. It was only briefly a hurricane over the central Caribbean Sea. 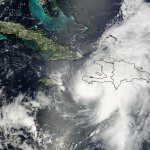 Ernesto almost regained hurricane status before making landfall in eastern North Carolina. Its main effects were flooding rains in Hispaniola and eastern North Carolina. Rainfall totals of more than seven inches was reported in the Dominican Republic, near eight inches in Florida and over 10 inches on coast of North Carolina. Hurricane Florence was a minimal hurricane that affected Bermuda. It passed about 50 miles west of the islands. Winds reported on Bermuda included a gust to 115 mph at the Maritime Operations Centre, 112 mph at St. David's and 90 mph at the airport. It became a large gale center that later affected eastern Newfoundland. 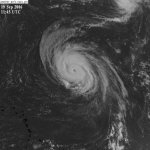 Hurricane Gordon was a category three hurricane that brought hurricane force winds to the Azores, as well as damaging winds to Europe as an extropical cyclone. 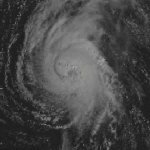 At its strongest Hurricane Gordon had top sustained winds of 120 mph. 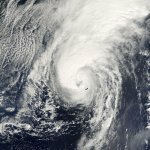 As it passed to the south of the Azores, winds gusted to 82 mph at Santa Maria. Eventually Gordon lost its tropical characteristics as it moved east. It still had strong winds as an extratropical cyclone as Spain had wind gusts up to 114 mph. 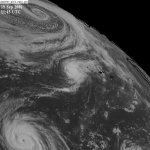 Hurricane Helene was another category three hurricane that harmlessly moved through the central Atlantic. At its strongest top sustained winds were 120 mph well northeast of the Lesser Antillies. Helene finally lost its tropical characteristics as it approached Irelend in the north Atlantic. Hurricane Isaac was a minimal category one hurricane that once again curved through the open Atlantic waters. It affected Newfoundland with winds that gusted to 60 mph.